October 2018 www.coalage.com 41 suppliers news continued where the selected business model will be adapted to the nature of both the operat- ing segments and individual markets. Polydeck Celebrates 40 th On October 11, Polydeck Screen Corp. cel- ebrated its 40th anniversary at the compa- ny's Spartanburg, South Carolina, campus. It was a two-day celebration attended by employees, partners and affiliates. The anniversary merits both grati- tude and praise, Peter Freissle, president, Polydeck, said in the opening speech. "The purpose of this event is to celebrate suc- cess and thank God," he said. "Less than 0.5% of companies make it to this point in their careers." Company literature traces Polydeck's history to 1959 when Freissle met Helmut Rosenbusch on the former's second day in Johannesburg. Freissle said the meet- ing was an answered prayer for a teenager who had arrived in South Africa broke and had spent the previous night at a homeless shelter. Rosenbusch was a third-genera- tion screen manufacturer with ambitions of launching his own business. The two Germans clicked and shortly thereafter Screenex South Africa launched. Roughly 10 years later, the compa- ny developed a prototype polyurethane screen panel. The technology gradually gained acceptance and grew in popular- ity and demand. Polydeck Screen Corp. launched in 1978. The company has continued to grow globally and opened facilities in Chile. That growth saw a more pronounced uptick in the recent past. "More than 50% of you sit- ting in this room as employees have joined us in the last five years," Freissle said. Throughout, the company remained private and family-owned. "We have the shortest lead time in the industry and the best quality in the industry, because of you guys," Freissle said. "We're part of some- thing really special. Every one of you made this possible for us and I thank you from the bottom of my heart." Sulzer Signs Deal With Nidec Industrial Solutions As part of a growing portfolio of services, Sulzer has signed an agreement with Nidec Industrial Solutions that will introduce cus- tomers to the high performance, energy-ef- ficient drives with class-leading mainte- nance services. Sulzer's extensive network of service centers throughout North America will provide expert, local support from one of the world's leading independent repair specialists of electromechanical equipment. Nidec Industrial Solutions has a long and distinguished history of manufactur- ing medium-voltage drives for industrial applications. With the expertise to design and manufacture custom-made drives for individual applications, Nidec has a strong presence in the market. The new agreement will see Sulzer provide both sales and technical support for MV drives. The company's experienced field service teams offer expert support on site, while the local service centers are equipped with modern repair facilities to ensure any downtime is minimized. At the same time, Sulzer's customers will have di- rect access to high-quality MV drives and excellent OEM support. Siemens, Bentley to Offer Integrated APM Solution for Power Plants Siemens and Bentley Systems have an- nounced a joint technology and service solution, consisting of their complementa- ry offerings, to speed up the digitalization of power plants and provide intelligent an- alytics with a range of innovative offerings and managed services solutions. The new service, to be hosted on Siemens' cloud- based open IoT operating system, Mind- Sphere, will combine Bentley's advanced asset performance software capabilities with Siemens' complementary technology and service expertise to empower power plant owners to take full advantage of dig- italization, which helps improve mainte- nance operations and planning. 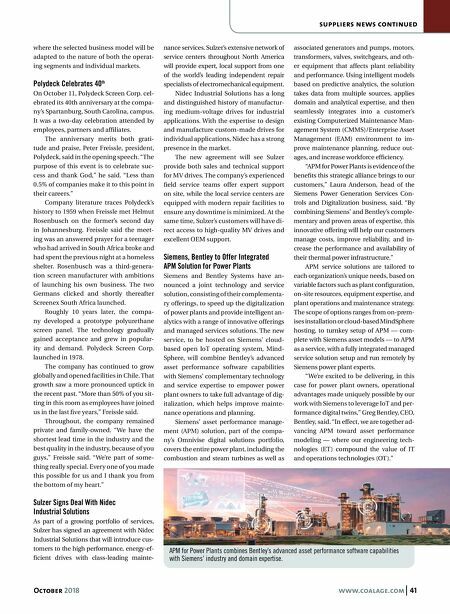 Siemens' asset performance manage- ment (APM) solution, part of the compa- ny's Omnivise digital solutions portfolio, covers the entire power plant, including the combustion and steam turbines as well as associated generators and pumps, motors, transformers, valves, switchgears, and oth- er equipment that affects plant reliability and performance. Using intelligent models based on predictive analytics, the solution takes data from multiple sources, applies domain and analytical expertise, and then seamlessly integrates into a customer's existing Computerized Maintenance Man- agement System (CMMS)/Enterprise Asset Management (EAM) environment to im- prove maintenance planning, reduce out- ages, and increase workforce efficiency. "APM for Power Plants is evidence of the benefits this strategic alliance brings to our customers," Laura Anderson, head of the Siemens Power Generation Services Con- trols and Digitalization business, said. "By combining Siemens' and Bentley's comple- mentary and proven areas of expertise, this innovative offering will help our customers manage costs, improve reliability, and in- crease the performance and availability of their thermal power infrastructure." APM service solutions are tailored to each organization's unique needs, based on variable factors such as plant configuration, on-site resources, equipment expertise, and plant operations and maintenance strategy. The scope of options ranges from on-prem- ises installation or cloud-based MindSphere hosting, to turnkey setup of APM — com- plete with Siemens asset models — to APM as a service, with a fully integrated managed service solution setup and run remotely by Siemens power plant experts. "We're excited to be delivering, in this case for power plant owners, operational advantages made uniquely possible by our work with Siemens to leverage IoT and per- formance digital twins," Greg Bentley, CEO, Bentley, said. "In effect, we are together ad- vancing APM toward asset performance modeling — where our engineering tech- nologies (ET) compound the value of IT and operations technologies (OT)." APM for Power Plants combines Bentley's advanced asset performance software capabilities with Siemens' industry and domain expertise.